When to start renal replacement therapy in patients with AKI has been a serious and incompletely answered question for as long as dialysis has been available to treat it. The seriousness of this disorder derives from its frequency, associated mortality, and cost. The JAMA contains a new study, Effect of Early vs Delayed Initiation of Renal Replacement Therapy on Mortality in Critically Ill Patients With Acute Kidney Injury. A single center study of patients treated at University Hospital Münster, Germany. 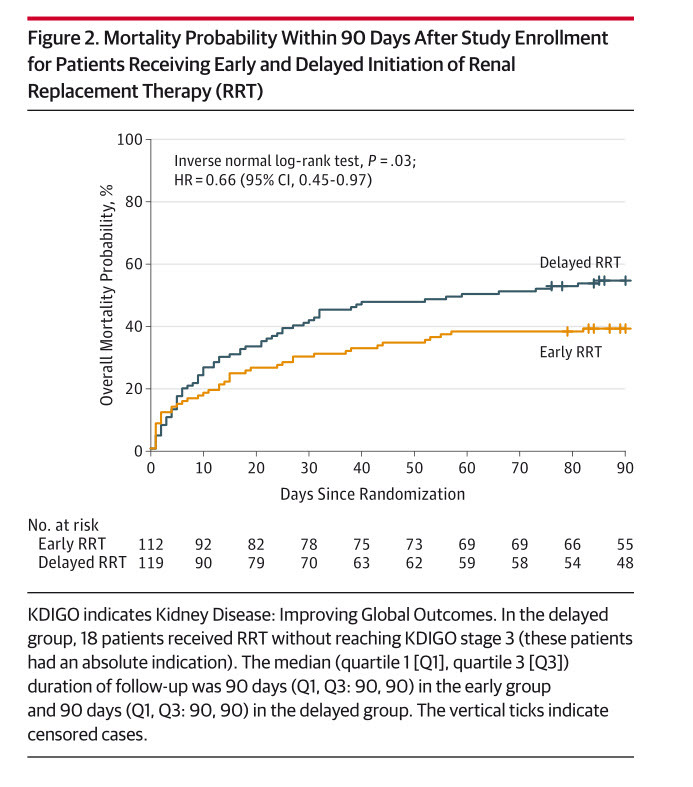 231 critically ill patients were randomly divided into two groups: “Early (within 8 hours of diagnosis of KDIGO stage 2; n = 112) or delayed (within 12 hours of stage 3 AKI or no initiation; n = 119) initiation of RRT.” [The awkward sentence is, as indicated, a quotation.] In addition to the usual criteria for the diagnosis of AKI, the patients had to have a plasma concentration of >150 ng/mL of neutrophil gelatinase–associated lipocalin, a marker of presence and severity of AKI not currently used in routine practice. An editorial that accompanies this study is impressed by the remarkable results of this and an earlier study of patients undergoing coronary interventions, in whom hemofiltration and saline infusion delivered before and after radiocontrast exposure were compared. Mortality was 2% in the former group compared to 14% in the latter. The editorialists seem to take the view that while evidence continues to accumulate that early dialysis for patients with AKI is efficacious, the absence of multi-center controlled studies prevents them from recommending this practice – ie, this is too good to be true. Of course, early dialysis for AKI has long been employed by nephrologists for these patients and likely will continue to be so used until convincing evidence against this therapy appears. It very probable that this is not too good to be true.